Study suggests changing the way schools measure students' career success | Tips for using UDL during instructional design | Initiative expands computer-science education across U.S.
Initiative expands computer-science education across U.S.
Be 'wowed' by the coolest technology out there. Recharge your creative batteries. Get excited about our industry and remind yourself why you love AV. 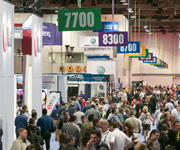 InfoComm 2015 is the largest event for professional AV in the world, with over 980 exhibitors and more than 38,000 attendees from 110+ countries. This is your once-a-year opportunity to see the latest audiovisual technology, learn the skills that will advance your career, and grow your professional network. Learn More and Register Now! Seeing how other schools and districts are getting creative with tech initiatives can be a great inspiration and knowledge source. What kinds of information do you want to see? Funding. Tell me where they got the money for the program. Buy-in. How did they sell it to their stakeholders? The plan. How they did it, from idea to deployment. Be careful what you set your heart upon, for it will surely be yours."